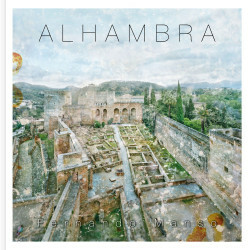 An extraordinary book of photography that shows us the Alhambra through the eyes of one of Spain’s most prestigious photographers. Fernando Manso captivates us once again with the beauty and poetry of his unique images made using a patient technique he has refined over the years. One of Spain’s most visited monuments portrayed in a uniquely surprising and fascinating way. A book that follows in the wake of the successes by the same author Madrid (Lunwerg, 2011) and Spain (Lunwerg, 2016). The Alhambra, declared a World Heritage Site, is one of the most emblematic and visited monuments in Spain. With a prologue by Luís García Montero.